Recent storms left a large area of western and central Minnesota affected by severe hail damage. Especially hard hit were Kandiyohi, Swift, Chippewa, and McLeod Counties, where much of the corn was at the V5 stage (5 collared leaves) when damaged and soybean varied from newly-emerged to two fully-developed trifoliate leaves (V2). 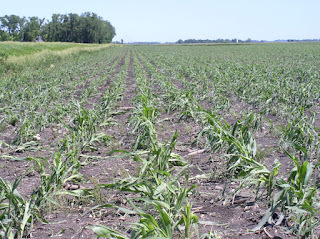 Yield potential of hail-damaged corn depends primarily on the number of remaining plants per acre with healthy growing points that will recover, the amount of leaf area lost on these plants, and the growth stage at which the crop was damaged. To determine whether a corn plant will survive and regrow, split stalks and examine the growing point. In corn, the growing point remains below the soil surface until the V5 stage (5 collared leaves). Growing points located near the soil surface can be damaged by freezing from hail accumulation around the base of plants. At the V8 stage (8 collared leaves), the growing point is located about 12 inches above the soil and has a small tassel at the top of it. Healthy growing points will be firm and white to yellow. If damaged, the growing point will be watery and orange to brown. Plants with damaged growing points will not recover. Another consideration is stem bruising. Severe stem bruising limits the plant's ability to translocate water and nutrients and also reduces standability. Plants with stem bruising should have their stalks split in order to determine the severity of the stem bruising, and whether the growing point has been injured. Plants with stem damage extending beyond the leaf sheaths and into the pith of the plant either will not recover or likely will have large reductions in yield. Fields with severe stem bruising should be harvested early to avoid significant losses from stalk lodging. When there is whorl damage to corn, new leaves can have difficulty emerging through damaged tissue and can become tightly bound in the whorl. Plants with leaves that are tightly bound in the whorl can sometimes break free after about one week of growth. However, many of these plants are unable to recover. This makes it difficult to assess final plant population within just a few days after hail. Yield potential for corn at various plant populations is listed in Table 1. When gaps of two feet or more are present throughout the field, assume an additional 5% reduction in yield. Table 1. Typical relationship between corn plant population and yield in Minnesota. In addition to yield loss from a reduced stand, growers should consider added yield reductions due to leaf loss (Table 2). Any green leaf area remaining on a plant will contribute to yield. Only consider leaf area lost if it is removed or brown. Table 2. Relationship between corn grain yield and leaf loss. Soybean plants with significant amounts of green tissue remaining (more than one green cotyledon and/or remaining leaf tissue) are likely to survive early-season hail damage, as they can regrow from axillary buds located at the juncture of the stem and leaves. Soybean plants cut below the cotyledons or entirely stripped of leaf tissue will not recover. Similarly, larger plants with a small amount of green leaf material remaining are likely to recover, but expect regrowth to occur slowly. Remaining stands will be set back. Soybean plants with significant stem bruising may recover, but will be more susceptible to lodging late in the season. Soybean can tolerate low plant populations well, with only small reductions in yield potential across wide ranges in stand loss. For instance, populations near 100,000 plants per acre are likely to produce maximum yields, and those around 80,000 will yield about 90% of the maximum. However, expected yields drop more rapidly in stands below 50,000, with 39,000 plants per acre likely to produce about 75% of the normal yield. For soybean, leaf loss alone through the V4 stage (4 fully developed trifoliolate leaves) has little effect on yield. Replanting should be considered only in fields where the crop is a total loss. Replanting corn at this time is not feasible as the crop is not expected to reach maturity (kernel black layer) before the first killing freeze. Soybean may be replanted, but yield will be limited somewhat by the shortened season. Final soybean yields are penalized at a a rate of about 1 percent per day. Soybeans planted on June 20 are expected to produce around 70 percent of an early planted soybean crop. By the end of June, that number falls to around 60 percent. Mid-June soybean plantings should employ soybean varieties that are about 0.5 maturity group shorter than is considered full-season. A 1.0MG soybean would be a good fit in the Willmar/Benson/Montevideo area. Replanting during mid-June is likely to produce a yield similar to that in an extremely thin soybean stand; therefore, producers must carefully consider all of the tangential factors: replanting costs, seed availability, weed control, and aesthetics. Seed availability may be the primary determinant for replanting or not. Producers should contact their seed suppliers as soon as possible to confirm that early-maturity seed is still available. Finally, if dicamba-tolerant soybeans were sprayed with herbicides containing dicamba, such as Xtendimax, FeXapan or Engenia, and then damaged by hail, herbicide restrictions complicate replant options. 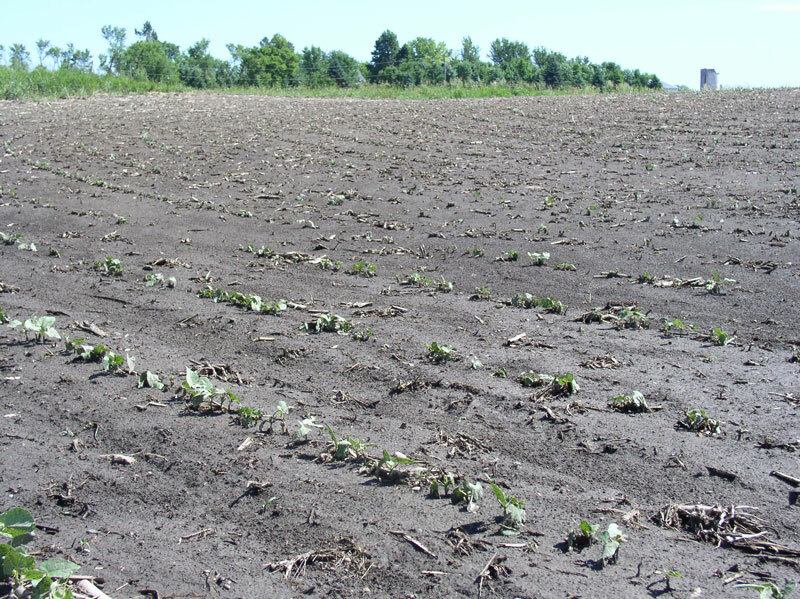 Caution should be used in re-planting or “spiking” in non dicamba-tolerant soybeans into these fields, since crop damage may occur from the residual soil activity of the previous application. Please refer to required rotational crop intervals from the container label as this main label will indicate the number of days that must pass before re-planting to non dicamba-tolerant soybeans. The waiting period for Xtendimax or FeXapan can range from 14 days for 11 fluid ounces or less to 28 days for 22 ounces per acre applications; the Engenia waiting periods are 14, 21 and 28 days when the previous application was ≤6.4, 9.6 or 12.8 fluid ounces per acre, respectively. For those producers who choose to keep their existing crops, care should be taken to ensure that these fields produce as much as possible. Because the crop has been placed under tremendous stress, it is important to reduce the level of future stresses. The most important and difficult challenge in hail-damaged crops often revolves around weed control. Maintaining good weed control in an open crop canopy is challenging. If replanting soybean, minimizing soil disturbance can reduce weed germination and maximize the effectiveness of soil-residual herbicides already applied to the field. While it is crucial to avoid further stress to your damaged crop, foliar fungicides are not likely to improve crop recovery and yield (see Do foliar fungicides provide a benefit to corn damaged by hail?). The most damaging diseases affecting corn and soybean after hail are bacterial in nature. Fungicides have no effect on these bacterial diseases. Planting a cover crop may be a viable option for areas where the original crop was completely lost. 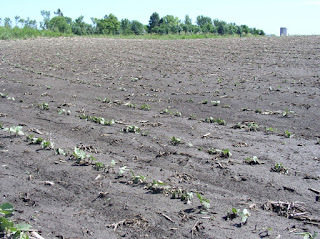 Additional considerations for such fields include weed control and avoiding fallow syndrome (see Drowned-out or hailed-out crops and prevented planting – What to do now?). Note the use of trade names is for clarity and educational purposes only and does not imply endorsement of a particular brand or product over another. Likewise, exclusion does not imply non-approval. 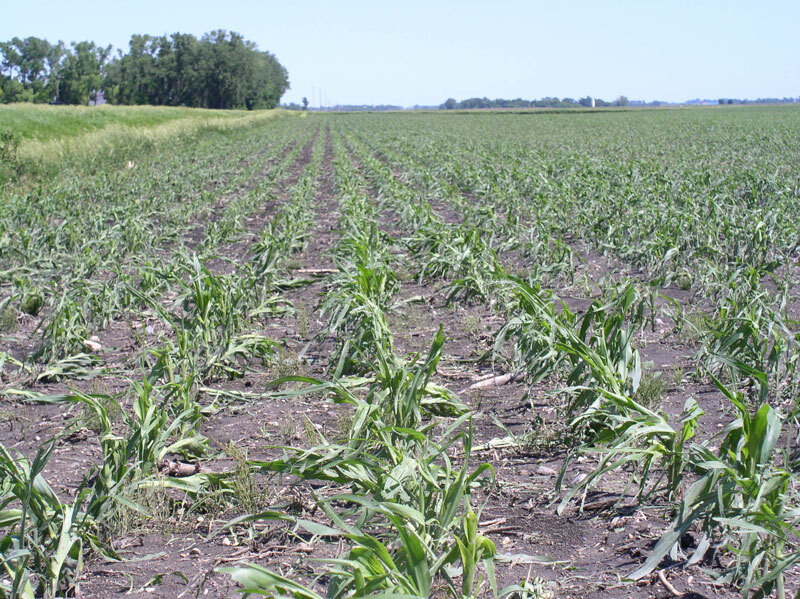 This article was adapted from a July 7, 2016 Crop E-news, Recovery and management of corn and soybean following hail and wind damage.